Among the practically meaningless words that pepper the culinary world, "authentic" inspires and infuriates. There are those who hew to the demonstration of authenticity - sometimes at the expense of enjoyment. But perhaps the most difficult thing about making authenticity a gold standard - is that there is no such thing. Cuisine, as is life, evolves. Regional practices become entrenched with tradition, but even that changes as people migrate, cultures adapted, and ingredients innovate. And, often, authenticity is just a nostalgic call for a time and place that no longer exists. On the other hand, authenticity also creates barriers that exclude the naive from exploring new cuisines. It's a brave chef that decides to break authenticity just enough make the unfamiliar friendly, but so much as to enrage the traditionalists. Over in Chicago, classically French trained chef Kristine Subido tries her hand at bringing flavors of her Filipino ancestry to America - though in a carefully orchestrated manner. Formerly a chef in the W Lakeshore Hotel, her restaurant Pecking Order just focuses on chicken. And though decidedly Filipino in inspiration, it does so in an understated manner. Pecking Order never explicitly mentions the Philippine derivation of the restaurant, but it has the subtle overlay of the Philippine flag on the logo, and these framed spoons and forks - an homage to traditional eating utensil setup in that country. 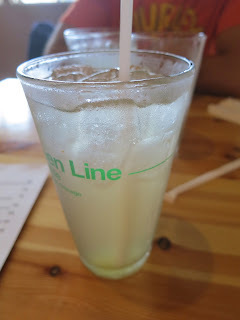 The menu makes mention of many classical Filipino flavor combinations, including cocktails made from the microcitrus calamansi (aka calamondin). I eagerly ordered a "limeade". Sadly, Pecking Order doesn't have sourcing for actual calamansi juice or pulp, instead relying on bottled premixed calamansi with honey or syrup. The result is a scented sweet item which has lost much of the tartness. I can imagine that this will be disappointing for people ordering the cocktails, and explains why the savory dishes do not leverage the bright flavors of the fruit. Garlic fried rice isn't really fried. 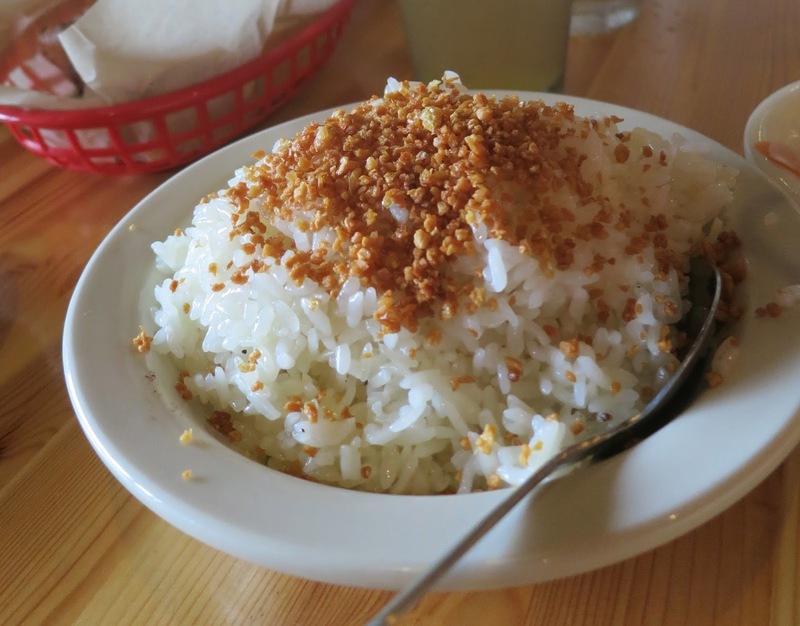 An interesting interpretation, where fried garlic and oil is simply poured over fresh rice. There's a lot of garlic used, no shortage there, but I think it puzzles the newcomer, and doesn't evoke the memories of sinangag. Chicken and the Egg noodles was a playful update to a classic. Sous vide eggs play with greens and roasted chicken and noodles, amidst richly flavored chicken broth. It's a bit too salty, but quite good. The chicken itself was masterfully cooked - despite being white meat. 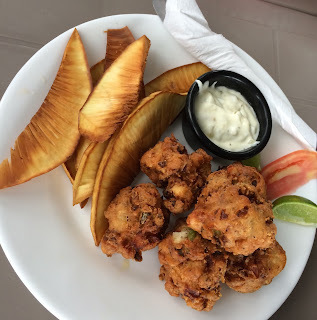 Served as a side dish, fried plantains with jackfruit chutney. This is a tribute to the Filipino dish turon, a kind of fried egg roll stuffed with saba bananas, and jackfruit, and studded with bits of burnt sugar. Here, it's updated with the more readily available plantains, and the jackfruit as chutney is a clever idea. I just wished the actual combination worked flavor-wise. But I'll be experimenting with jackfruit chutney as inspiration. All in all, I liked what Pecking Order is trying to do (and I don't know if they chose to do an all chicken restaurant by accident, but it's also a very clever homage - the domesticated chicken originated in the Philippines/Indonesia region), but I don't think they've hit that fine line between authenticity and daring just yet. The flavor profiles are dedicated to neither direction, coming across as undecided. But it's worth a try.